The garden project completed...and a little extra on the allotment! Well it's kind of late but I wanted to get this post up today. Having said that I am also very tired so if it turns out a little rambly please forgive me!! OK...where to start?? I guess at the beginning is as good a place as any. My garden has always been child friendly and designed for the kids benefit so is quite low maintenance and grass and slabbed. A few years ago my Son decided he wanted a basketball hoop and saved up his pocket money and birthday money to buy one. Because of this I decided to take some of the grass up and lay slabs. It worked well even though I am no slab layer and they were all crooked and mismatched so didn't really do much for the whole outlook on the garden it made my son incredibly happy. Well the basketball hoop has sat untouched for the last year and started to go rusty as the slabs sank even more. My hubby declared it was time to sort the garden out and I totally agreed but said I wanted to go back to having a nice lawn so that was the decision made. We also have a shed which ended up with quite a bit so ball damage so the wood was split in places and it was very well weathered...our shed is something like 12ft by 8ft which is an awful lot of shed and also has electrics in it so we looked into it and decided re-cladding was the way to go as it was a lot cheaper than replacing the shed. Well work started on Wednesday when we lifted the slabs...there were about 80 in all and as we had spent the money out on them and didn't want to throw that money away I utilised most of them at the allotment giving me a couple of lovely stepping stone paths and also a walkway between my runner bean and grape fences. A few slabs left over were donated to my parents and a neighbour. The kids helped me lift the slabs and we got it done in a couple of hours. My two stepping stone paths to the shed and the greenhouse. Work to re-clad the shed started on Thursday...we hired Dave to do this as it's his trade and he would also lay the new lawn as although I am quite handy I wanted a good, quick and efficient job done. As Dave finished one bit I went along with the creosote brush and also got the garden bench done at the same time. I didn't have the lawn laid right up to the fence as I decided another flower border would be nice next year. Dave starting work on the shed. It took two days for Dave to complete the work and then I spent today tidying up, mowing the front lawns, and turning the soil for the new flower bed that has been under slabs for the last few years. I have to say I am very happy with how it has all turned out and can't wait to be able to sit out next summer and admire the garden...what do you think?? The garden complete..and a lovely sunny day to show it off!! So that is now finished and I have one extra job that I want to do on the allotment before it gets too cold but I will tell you more about that once I get on with it!! A while ago on one of the blogs i follow there was a seed giveaway competition...it was very straight forward which suited me down to the ground as usually once I manage to prize the kids away from the computer it's quite late so I can only cope with simple things. Anyway the rules were...if you're interested then leave a comment. Yep that was it...so simple and i was definitely interested so I left a comment!! Well surprisingly (because luck doesn't tend to find me too much) I win the giveaway and received my seeds in the post today. I first of all have to thank 'Zuckie' for picking me as the winner and then I have to thank Craig for the great seeds I have received in the post today. The seeds I got in the post today!! Craig is quite a new blogger and quite new to the allotment world so go and check out his blog at 'dykes edge allotment' and see what amazing things he has been up to and what his future plans are...you can also meet 'Zuckie'...but please remember to come back and visit me too..I may not be as inventive as him but I still love that you all come and check out my blog!! The Garden project is coming along nicely...hopefully it will be completed and revealed tomorrow!! Weather watch wednesday week 43 2010....and a busy week. Well first off I just want to apologise to all the blogs I usually follow as it's been a busy week as the kids have been off school so with dental appointments, sleepovers and lots of baking this is the first time I have managed to sit down at the computer and I have to catch up on all the blogs I follow which isn't going to happen until tomorrow. I also have a garden project going on which the kids have been helping me with as it's required lifting slabs ready for a new lawn which were then utilized down the allotment and now I am waiting for the lawn to be laid and the shed clad which will start tomorrow. As for the weather, well it's been a bit up and down from heavy showers and icy winds, to clear still days. The temperatures dropped and we had a few frosts although today they have picked up a little and it's been pleasant to be outside in the warmth of the sun. Will post again tomorrow with some pictures so you can see what we've been up to. Well I went up the plot somewhat reluctantly this afternoon. The weather was stop and start rain continually and when the rain started boy did it pour. I didn't have much enthusiasm when I first went to the allotment but once I got started and found a rhythm I got on quite well. 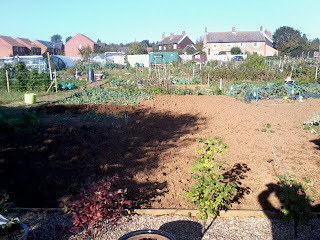 I was left of a bit of a dilemma as to which way to go with my bit of ground that hadn't yet been dug for the winter. You see not only had it not been dug but it also never got planted on this year and so therefore never got weeded or dug previously wither. With the sudden turn in weather I was left with three choices. Weed the ground properly and not have the benefits of the winter dig as the soil would be finely broken, Clear off the top of the ground and then winter dig it and let the weather kill most of the roots off and break the soil up or Just winter dig it. I went with option two as this seemed a good medium and I certainly didn't want to be starting next season with hard packed flat soil which hadn't had the benefits of the winter elements. This said I managed to complete it today (and managed to get VERY wet in the process!) and although you see a lot of twitch roots about I am happy with what I have achieved and the decision I have made as i know that much of this will die off through the winter as the ground is not going to insulate the roots this year. I also picked up my broad beans and garlic this week and I have put them in the ground ready to start germinating. I have planted about 60 garlic and about 200 broad beans....the broad beans are sown quite thickly in two rows so if any don't germinate there won't be large gaps about!! Oh I have also put in the ground a few over wintering onions which were given to me so I will see how these go. As a celebration of completing my winter dig I have brought all of my gardening gloves home and coats and scarves to go through the washing machine. I still have my gardening jobs to do but it will be nice to do them next week in gloves that I don't have to make pliable again by bashing them on the wall...lol. Don't worry though...you can't get rid of me that easily...the winter dig maybe complete but I still have plans to carry out and musings to write about from the growing season so I will still be posting and hope you will all still be reading!! Weather watch wednesday week 42...and introducing 'The Mumpkin'. The weather has been pretty stable over the last week. A little rain but usually in the late afternoon and evenings so it hasn't effected us too much although mostly the days have been overcast and dreary...adding to that the fact that the days are becoming short very quick make it quite oppressive. Today however bloomed clear, bright and sunny...and with that our first frost. It wasn't a heavy frost and was more above the ground than on it but there was definitely a bite to the air with the morning temperature being only three degrees!! Pumpkin soup and roasted pumpkin seeds...this came from just one pumpkin..oh and there were twice the amount of seeds before the kids got their hands on them! I spent the day staying toasty inside by doing some cooking, it's on those cold days when I love to cook and the house fills with warmth and lovely aromas...on the menu today was pumpkin soup and roasted pumpkin seeds. I have never grown or eaten pumpkins before but I have to say I am happy with the results and will be growing them again next year!! And now for the 'Mumpkin'...no people...I did not miss-spell the title of the post...check out the photo be;low and see what you think! This started out it's life as an ordinary marrow but grew up to be rather orange. I haven't cut it open yet but when I do I will let you know what colour the flesh is. My nephew decided we should call it a 'Mumpkin'. So there you have it...the 'mumpkin' has been brought to life. I am thinking about saving some of the seeds to see if they will grow like this again. Anyone else had some weirs happenings on their allotment?? This is just a quick tip for any of you putting raised beds onto your plot. Make sure you thoroughly dig and weed the ground before putting your bed into place and filling it. I know this sounds like something very simple but I didn't do this before I put mine in and now I am battling getting the twitch out that is very deep and didn't raise it's ugly head for about three months to show itself...I guess you learn by your mistakes. Here's hoping some of you can learn by mine and save yourselves some time and work!! So this is what I started with at 8:30 am. This is what was left after I cleared the weeds...now ot dig the spuds!! The Desiree potatoes. Quite a good crop, not as many as the King Edwards but overall the potatoes are larger and will be good for baking. A carrier bag full of Charlotte's..this came from the last 4 plants left in the ground. This is what we have now!!! 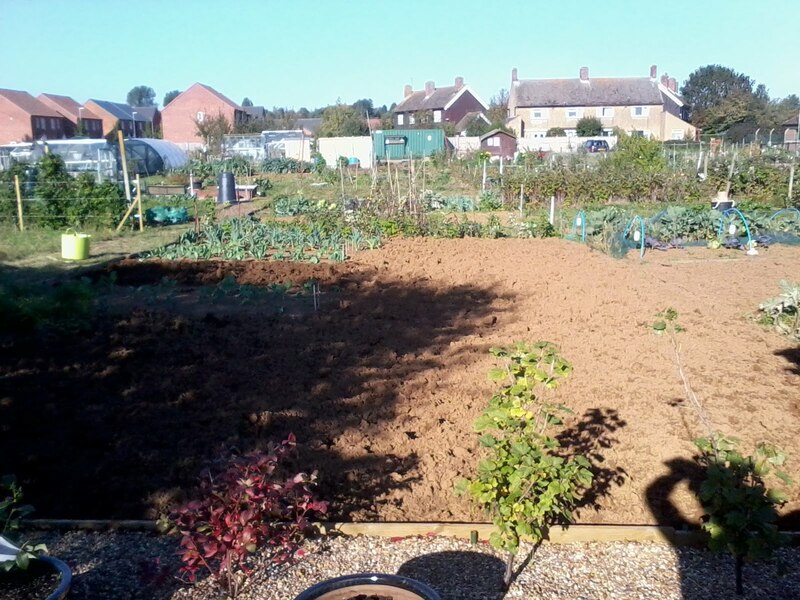 So all in all a pretty productive day....Not much ground left to weed and dig now as you can see and I really feel like I have made excellent progress this year!! I even taught Kate how to winter dig and the benefits of it...I guess there is hope for us all!!! Well not much to report on the weather this week really. It has been surprisingly mild for October....no frosts in my area yet and temperatures still getting into the teens during the day. We haven't had a single drop of rain this week though have only seen the sun a couple of times...but I can handle that if the temperature stays put and the rain stays away. Light breezes only which has made it a pleasure to work outdoors. I daren't look at the predictions for next week in case our luck is about to change...I really hope it at least lasts through the weekend so that I can get my Desiree potatoes out of the ground! Hope the weather is being as kind to you. Well I got down the allotment for a couple of hours yesterday and then again today for another few hours. Yesterdays weather was pretty overcast again but today the sky was clear and the sun was warm and I got finished everything that I had on my 'to do' list for this weekend. I have to say I am very proud of my achievements. 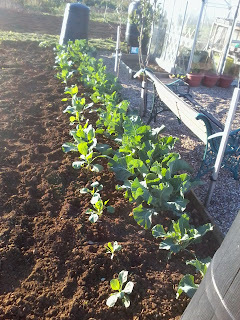 One half of the plot has had its total winter dig and there are just the winter brassicas and leeks in there now. Winter dig complete...very neat and tidy now. I got the leeks I was given planted up in the greenhouse and the brassica bed and the new side all nicely weeded...It was a lot of work but very satisfying to complete. 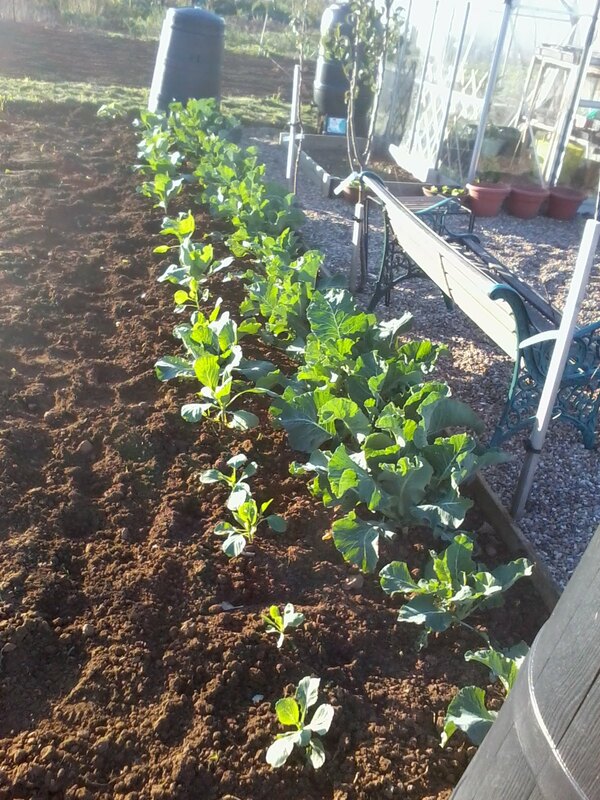 The Brassica bed I showed you in my last post...now nicely weeded!! Now the next task will be to dig up the potatoes but with a busy week ahead that will have to wait until the weekend!! My 200th post..and an epic day at the allotment!! Well as I said in yesterdays post no matter what the weather brought today I was going to get some work done!! The day dawned misty and grey and although the mist lifted it stayed grey but the air was warm and it was dry so turned into a perfect day to get some serious work done on the allotment. When I first got there dread hit me at the enormity of all the tasks that had to be done but I took it a little bit at a time and soon got into the swing of things. I started off in the greenhouse by picking all the peppers and chillis and then emptying out the tubs followed by emptying out the melons. I got 2 melons in total of the three plants which wasn't a fantastic return but they were very tasty and I will give them another go next year. My bell peppers didn't do so great only producing 5 fruit off the 3 plants but 3 of those did go red this year so that was an extra achievement....I don't know why bell peppers don't like to grow for me?!?!?! My chilli peppers did great and produced lots for me and I have plenty to string and dry for over the winter..I even had a few that turned red! The tubs from the chillis and peppers now have potatoes in them...hopefully in time for Christmas. I then got stuck in planting my winter lettuce in the ground in the greenhouse...I actually bought these several weeks ago and felt very bad about neglecting them for so long! I just got all this finished when I had a visit from an allotment neighbour 'Dave' (not the fence guy Dave...this is another one) who brought me a present over. It was some seed heads from leeks and he told me about...erm I think he may have called them bullets...or pellets...well maybe some of you will know...anyway the bits that grow in them that are leeks growing on and not the seeds and apparently if I take these off and put them in the soil in the greenhouse I will have leek plants ready for next spring...I was excited to hear about this and happy to learn something new so I will definitely be giving it a go...Dave said they always grow better than those from seed. 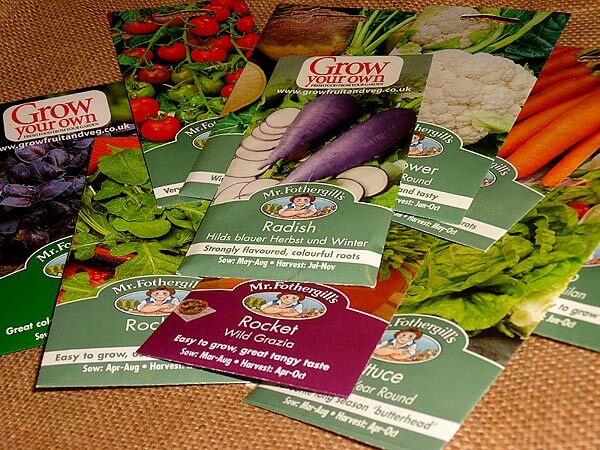 I haven't planted these yet but it is a job for tomorrow morning. Then it was the great tidy up. The squash plants all came up as did the sweetcorn..I have two semi orange pumpkins and a few courgettes which I picked and were ok, I also got two more good corn cobs but that was all...After all these were up and sorted in the composter I then had a good look at the celeriac which was also gifted to me from Dave who gave me the leeks. These were a huge disappointment...although the tops looked great under the ground there was nothing so I decide to pull all these too and add them to the compost bin. That done I was able to survey my land a bit more..and also see all the weeds...so much work still to be done. My slightly orange and slightly round pumpkins. At this point I got a phone call which meant I would have more time on the plot than I first anticipated as I wasn't needed for work so I was very happy!! I popped home for a cuppa and the toilet..(I'm sure you really wanted to know that...lol) and then headed back down and picked a huge bag of runner beans before tackling the weeding......I got quite a bit done before I went home and cooked up a curry for tea...Ok I cheated a little with the curry as the sauce came out of a jar but it tasted good and was very warming!! After tea back to the plot to do a bit more weeding and then when I got to a certain point I thought it would be a good idea to rough dig the newly weeded land for winter...I borrowed Kate's fork as it was at the end of my plot and was handy. I haven't mentioned Kate at all this year...She has done really well and for the first time since we got the allotment has manged to plant her whole plot out...she also had some beautiful cauliflowers which I was very envious of...she even stayed on top of the weeding a bit more this year. Kate is trying green manure this year and has chosen 'rye grass'. I wish her luck with this but I haven't used and as I am way to cautious about it and have heard as many bad reports on the stuff as good which has kind of put me off!! So that was today's work...I came home in the dark..very tired but also very satisfied with my accomplishments...I think in total I spent about 6 hours on the allotment. I plan to go again tomorrow to finish the bit of weeding where the peas were and also to weed round my caulis and cabbages which I know are there somewhere and I am quite excited about as I can see a couple of lovely heads forming on them. I know there are brassicas in there somewhere!!!! I still haven't got my Desiree potatoes dug up and they may not get done tomorrow either but I know they will be Ok in the ground!! So now I am off to lay on the sofa and watch movies or knit and relax before it all starts again tomorrow!! Oh and on a totally random note...how do you spell 'Chilli'?? No matter what I seem to type the dictionary tells me I'm wrong but if I bring up variations then 'Chilli' isn't there!! Well today dawned bright and beautiful and stayed like that ALL day!! I whizzed round town to get the shopping done and then spent a good 5 hours in the garden getting it sorted and tidied up. The tomato plants came up and the lawns were mowed and edged and even though they were still wet they look so much better!! I also took up the bedding plants which seemed to have turned to mush with the torrential rain we've had over the last couple of weeks and got all the weeds out in between the slabs too. I am now pleased that the garden is looking like my garden again and not as if a tornado had hit it several times over...it's pretty colourless but I can handle that for a while as I look out my window and see neat beds and weedless slabs. I even got some washing dried on the line today which makes it smell so much fresher than having to dry it indoors and I plan to iron that tonight so that I can get up to the allotment tomorrow....I'm hoping for a repeat of today's weather but have decided that no matter what it's doing I will still go as there is a lot of work to be done and while the mild temperatures persist I am going to get stuck in!! Thursday was dry and sunny, quite warm if a little windy. Friday was torrential rain all day. Saturday was dry and sunny, quite warm if a little windy. Sunday was torrential rain all day. Monday was pleasant once again with light winds and sunny spells. Do you think you are noticing a pattern here?? Well then it changes!! Tuesday...DRY, that's right, we had two dry days in a row...well almost...the rain started after dark!! Wednesday started rainy but did clear up by lunchtime...according to the forecast we are in for a dry few days now...I just pray that they are right. The only thing I can't complain about are the temperatures which are still into the double figures most nights as well as the days and I have yet to put my heating on even though we are now into October!! Well that's it....I was trying to look for a site where I could get the predicted forecast from and put it up on my site...couldn't find one yet but hopeful for next week...and you never know if they are predicting sun it might even bring a little colour to the blog...however I won't hold my breath!!! What not to do with your Chilli Peppers!!! Ok the weather has been wet most of the week and although today was better and we had some sun and blue skies I was gardening so still didn't get to the allotment at all...maybe the weather will hold out tomorrow too and then I might get a bit done but I won't hold my breath. Anyway I thought I would take this opportunity to show you my little 'oopsie' with my chillis. I picked some green ones off the plant and had them in my pocket....foolishly when I took them out my pocket I put them on the windowsill where the sun proceeded to bleach the colour out of them!! Of course they are still edible but don't look exactly appetizing anymore...guess these ones will be going into mince and stuff as opposed to colourful stir-fries!! !